Eyes in the Dark (2010) - Sci-fi-central.com. USA  2010  78m   Directed by: Bjorn Anderson. 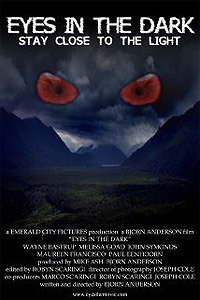  Starring: Wayne Bastrup, Melissa Goad, John Soren, Maureen Francisco, Telisa Steen, Melinda Raebyne, Jason Robison, Paul Eenhoorn, Ernie Joseph, Charlie Sims, Christine Umayam, Mike Ash, Stuart Campion.. Seven students decide to vacation at a mountain lodge looking for relaxation, beer and maybe a dip in the hot tub. When they find a hidden cave and stumble on clues about an ancient legend, unsettling signs start to appear, and the lodge caretaker's strange behavior suggests that they may have crossed a frightening force. I don't want to write any spoilers, so just to say, this movie ticks all the boxes for found footage genre but does not break any new ground. You get the expected poor quality shaky film footage, the sound is surprisingly good with some nice creepy noises coming from the woods. A lot of the film is in the dark but that is usually a good thing for these types of films. The acting is better then average and the film has a good pacea bout it, not really any special effects to speak off but the creature is passable and not CGI which is something I always appreciate. If you enjoyed movies like Evidence (2012), The Dyatlov Incident (aka, Devils Pass), The Chernobyl Diaries etc then you will enjoy this film. Made me jump a couple of times which is always good! Review by cummyduck from the Internet Movie Database.